SAN DIEGO, Sept. 5, 2007 ? Sony is expanding its a (Alpha) digital SLR system with the introduction of the DSLR-A700 camera, which is aimed at photo enthusiasts or serious photo hobbyists. The new model features advanced imaging technologies and ultra-responsive operation, as well as a lightweight, dust- and moisture-resistant, magnesium alloy construction common to enthusiast-class D-SLR cameras. Like Sony?s mainstream DSLR-A100 model, the new A700 unit incorporates Super SteadyShot® Inside image stabilization in the camera body and is compatible with most Minolta Maxxum® mount lenses in addition to Sony lenses. ?Discerning photo enthusiasts will be impressed with the rugged construction and outstanding performance of the A700, said Phil Lubell, director of marketing for digital cameras at Sony Electronics. ?We also expect that this new camera will re-define the post-capture experience with HDMI? output for high-quality playback of images on high-definition televisions.? The camera?s new 12.2-megapixel Exmor? CMOS sensor conducts analog-to-digital (A/D) signal conversion and dual noise reduction right on the sensor itself. Noise reduction is applied to analog signals before A/D conversion and the resulting digital signals are then subject to a second round of noise reduction. According to Lubell, ?These digital signals are virtually immune to external noise and interference.? Clean, noise-free digital signals are then sent to the newly developed BIONZ? processing engine. Lubell said this engine has been optimized to process data-rich picture information at high speeds, and to reduce picture noise in the RAW data stage before final image compression and encoding. The results are high-resolution, detailed images with rich tonal reproduction. 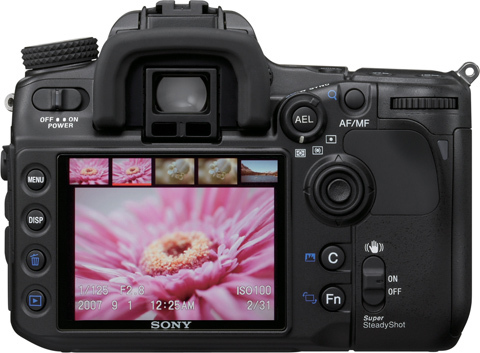 The A700 camera is engineered to be fast and ultra-responsive so as to become ?a virtual extension of your own senses,? Lubell said, ?capturing fleeting moments as you see them.? A newly developed, auto-focus system features 11 wide-area sensors, including a center dual cross sensor comprised of two horizontal and two vertical line sensors for exceptional AF precision. An F2.8 line sensor leverages the brightness of fast aperture lenses for even greater precision. Lubell said that extraordinary focusing speed has been realized through improved algorithms and a high-torque focusing drive motor. The large, bright, viewfinder uses a precision-ground optical glass pentaprism and a high refractive index eyepiece lens to provide 0.9x viewfinder magnification and 95 percent frame coverage. Manual focusing is aided by an interchangeable spherical acute matte focusing screen. The camera has a high-performance vertical traverse shutter with a maximum shutter speed of 1/8,000th of a second to freeze fast-moving action. A high-power coreless motor charges the shutter and mirror mechanism, allowing continuous shooting at up to five frames per second. In JPEG fine or standard mode, continuous shooting is limited only by the capacity of the media card (sold separately), while up to 18 frames can be captured in RAW. The new camera features fourteen creative styles, including night view, autumn leaves or vivid, which can be selected to enhance images. These effects can then be fine-tuned by customizing contrast, sharpness, zone matching and other parameters. Sony?s Dynamic Range Optimizer (DRO) function has been updated on this model so users can choose the desired level of detail recovered in areas of shadow. The advanced mode offers the option of five levels of user selectable correction. Additionally, DRO bracketing creates three images from a single capture with three different levels of DRO. There is an extensive array of customization options to personalize the camera to match shooting styles. The unit?s quick navigation interface can be accessed instantly with the four-way multi-selector, and selected parameters can be adjusted directly by control dials. Up to 28 camera settings can be stored in one of three user memories for instant recall. The unit?s custom function button can be assigned to 15 frequently-accessed functions. With the supplied remote capture application, the camera can be controlled from a compatible PC via USB without even touching the camera, and files can be stored on the computer instead of the media card. The A700 model features an HDMI output for connection to HDTV sets, putting a high-resolution spin on the conventional photo slideshow. When connected to a Sony BRAVIA® LCD HD television, photos are optimized for viewing with the new ?PhotoTV HD? mode. This mode brings the look of actual printed photography to the television, reproducing high-quality digital photos by fine-tuning such image parameters as sharpness, gradation and color specifically for photographs. The exceptional viewing experience of this camera also extends to viewing photos on its 3-inch LCD screen. The screen?s size and ultra-sharp resolution (921K) makes it possible to check focus and image quality with much greater accuracy. The camera will be introduced with two new lenses, bringing Sony?s lens and teleconverter catalog up to 23 models. Supplied as a standard kit lens, the new DT 16-105 mm f.3.5 ? 5.6 lens features a distinctive zoom range (35mm equivalency of 24 ? 157.5 mm); compact, lightweight design; and internal focusing. The other addition is a powerful and compact high-magnification DT 18 ? 250 mm f3.5 ? 6.3 lens. Sony is also planning to introduce a specialty 70 -300 mm f4.5 ? 5.6 SSM G telephoto lens featuring super sonic wave motor auto focus drive system for smooth auto focusing in Spring 2008. Sony?s full line of accessories will also expand to include a new vertical grip. Equipped with buttons and switches for the most essential control functions, it offers the same ease of operation and handling as when shooting vertically. It houses two InfoLithium® batteries (sold separately), which will automatically switch to the second battery when the first one runs out. Remaining charges of both batteries are displayed on the camera?s LCD screen. The model also features separate slots for Memory Stick Duo? media cards compatible with the Memory Stick PRO-HG? high-speed data transfer standard, as well as CompactFlash? Type I/II media cards compatible with the new Ultra Direct Memory Access standard for up to 300x write speeds. Sony is also introducing new 300x high-speed CompactFlash? memory cards, ideal for high-end photographers requiring fast write speeds. The new models, available in 2GB or 8GB capacity, expand Sony?s current line of CompactFlash cards that also include 66X and 133X speeds, with capacities ranging from 1GB to 4GB. The DSLR-A700 camera body, DT 16 ? 105 mm lens, and DT 18-250 mm lens will be available for about $1,400, $580 and $550, respectively. The DSLR-A700K kit with an 18-70 mm lens will be available for about $1,500, and the DSLR-A700P kit with the 16-105 mm lens will be available for about $1,900. 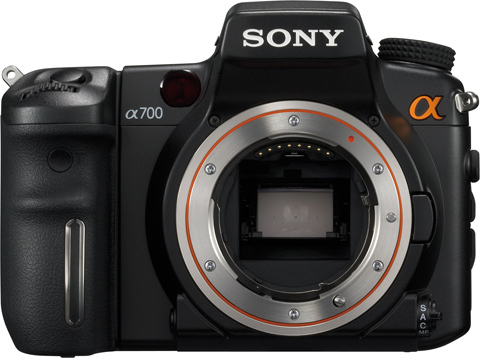 The camera body and DSLR-A700K kit will ship in October and the DSLR-A700P kit in November. All will be available at sonystyle.com, Sony Style retail stores (www.sonystyle.com/retail), at military base exchanges, and at authorized dealers nationwide. Pre-orders begin online today at www.sonystyle.com.